Loose hinges can cause a door to stick, bind, or scrape the floor. Lucky for you, it is easy to tighten loose hinges and make your doors work like new. Most hinge problems can be solved with nothing more than a screwdriver. First, check that the hinge screws are tight. Open the door, grasp it by the lock edge, and move it up and down. If you encounter movement at the hinge screws, they need to be retightened. 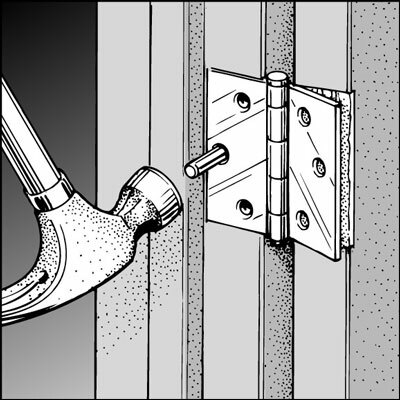 If the hinge screws have been loose for only a short time, you may need to tighten them with a screwdriver. But when hinge screws are left loose for a long time, the constant movement of the hinge plate and screws enlarges the screw holes. Eventually, the holes become so large that the screws can’t stay tight. The result: stripped screws that are completely useless! Dip the bare end of a wooden match in some carpenter’s glue and tap it with a hammer as far into the screw hole as it will go. If the screw is large, you may have to put several glue-coated matches in the hole. Break or cut off the match(es) flush with the hinge plate and discard the heads. After you’ve filled the void in the screw hole with the wooden match(es), drive the screw into the hole with a screwdriver. Remove the next screw and repair its hole, continuing until you have fixed all the enlarged screw holes. In place of a match, you can use wooden golf tees coated with glue to plug a stripped screw hole. Golf tees are tapered, so they fit easily into the screw hole. Let the glue dry and then cut off the protruding part of the tee.